Home » iPhone Tips » iPhone Applications » How To Access Your PC with iPhone from anywhere? How To Access Your PC with iPhone from anywhere? 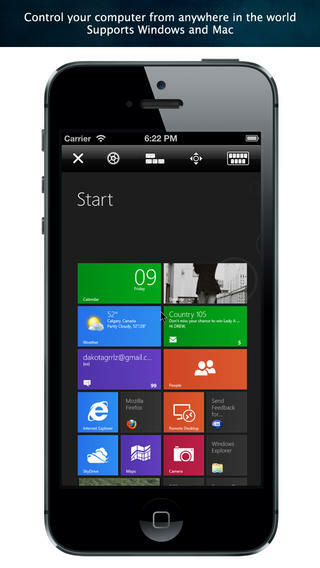 Access Your PC with iPhone from anywhere. iTeleport is the name of an app for iPhone that gives you complete access to your PC from your iPhone. Not only when you are around near the PC, when it can access it through Wi-Fi, but remotely using internet and some configurations. Jaddu helps you to put all the contents of your desktop to your fingertips on iPhone. Setting up the app on Mac is very straightforward and simple while it is somewhat involved in case of PC. Once the connection and set up is done, you can do all things on your iPhone, the things that you were doing on the desktop. The setup will give the total access to the PC from anywhere in the world. READ Android Apps vs iPhone Apps - Which Apps are Better? Connect the iPhone to your PC and iTeleport ports it to the PC with the display of spinning wormhole which shows your desktop. You can pinch it to zoom in and out and by using touch screen to navigate the cursor around the screen. You have to tap to initiate click action. With this technique you can browse all the files and programs on your base PC on the iPhone. You can tap the keyboard icon, which will present you the keyboard where you can type the text for sending in the mail. Get this iTeleport VNC app for iphone, ipad and ipod touch from itunes apps store here.